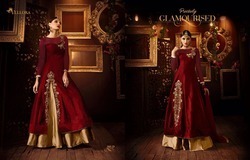 Offering you a complete choice of products which include embroidered lehenga, lehenga choli, party wear lehenga, digital print banglori silk lehenga, wedding lehenga and designer lehenga. We are suppliers of Digital Print Banglori Silk Lehenga. Top-banglori silk work, slives and flaier net work, dupatta- naznin.